Young Blood/Old Age, 2008, ceramic and veneer, 18 1/4 x 18 1/4 x 30". 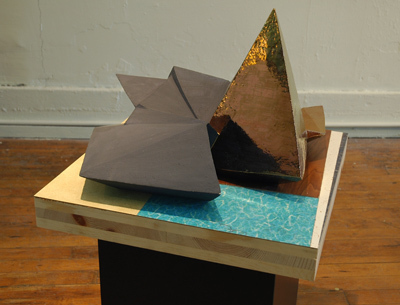 Laith Karmo puts as much thought into the pedestals that support his sculptures as he does the works themselves. Both contain a deft blend of clunk and elegance. Karmo grew up in suburban Detroit and attended the nearby Cranbrook Academy of Art, so it comes as no surprise that his works conjure two key components of life in the city’s metropolitan area: basement recreation rooms (evoked by the pedestals’ laminate, Formica, cedar, veneer, and plywood), and cars (implied by the ceramic sculptures themselves). Covered with lusters, the pieces bring to mind various automobile tropes: a newly washed convertible, zooming down a highway, or a vintage hatchback rolling along a country back road. When not in homes, Detroiters seem to be in cars, which function, in a sense, as rooms or furniture. Karmo’s sculptures hint at far-out adventure. Their physical assurance makes them seem, like moving vehicles, simultaneously to pass through and remain separate from their surroundings.